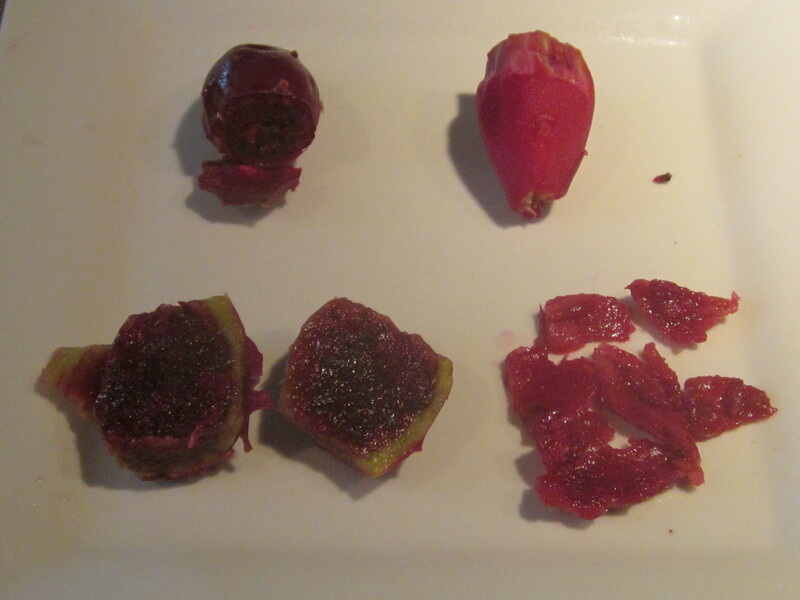 When you can still find big juicy prickly pears, it’s time to try some recipies using the flesh of the fruit. 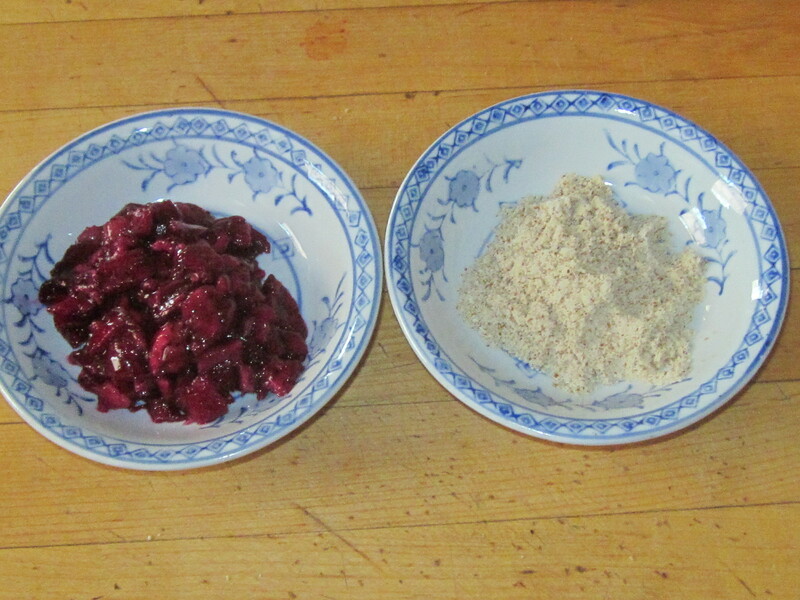 Later when the season has passed we can still cook with prickly pear, but we’ll be using syrup we’ve made and juice we have frozen. 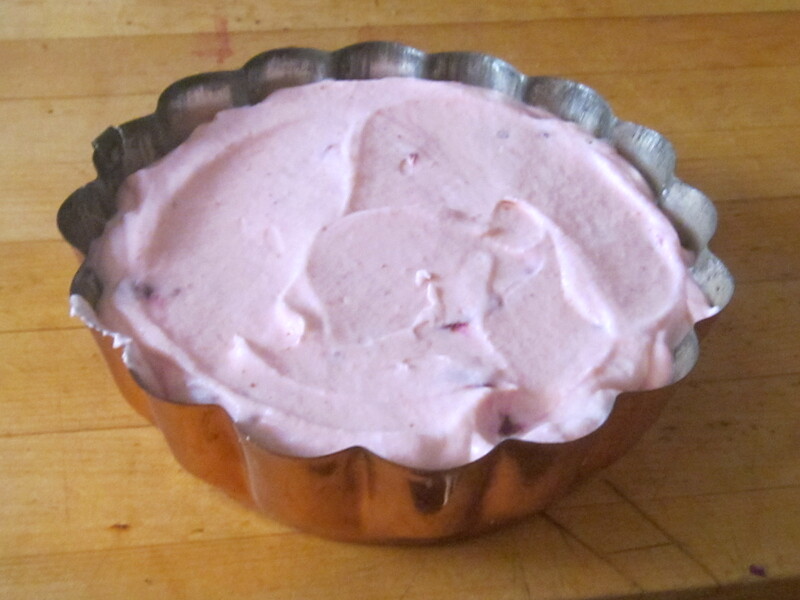 I’m going to tell you how to make a light and luscious summer dessert called Prickly Pear Blanc-Manger. Pronounced blah-mahn-jhay, it is one of the oldest sweets we know, possibly dating from Roman times. You will need a cupful of prickly pear fruit chunk,s but preparing them is a sort of fussy job. First agenda item: pull on your heavy-ish rubber gloves and locate the tweezers. Rinse the fruit to wash off any dust. Then, handling each fruit as gingerly as possible, use a sharp knife to cut off the blossom end. Peel from there to the stem end. Then cut each fruit in half and carefully scoop out the seeds. Cut what’s left into about four pieces. Repeat until you have a cup full. Peel and cut the prickly pear fruit. Here are the four stages in the preparation. This dessert is basically milk and cream, firmed up with gelatin,given a little heft with ground almonds and flavored with prickly pear fruit and seasonal berries. First I’ll show you some photos, then give the recipe. Get your prickly pear pieces and ground almonds ready first. 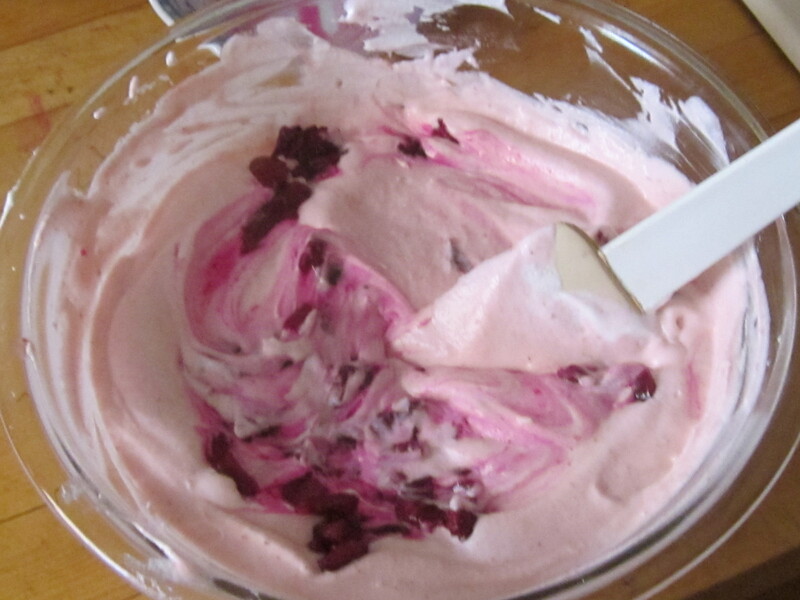 After the cream is whipped, gently fold in the prickly pear pieces. Turn the mixture into a mold or even an 8-inch cake pan. 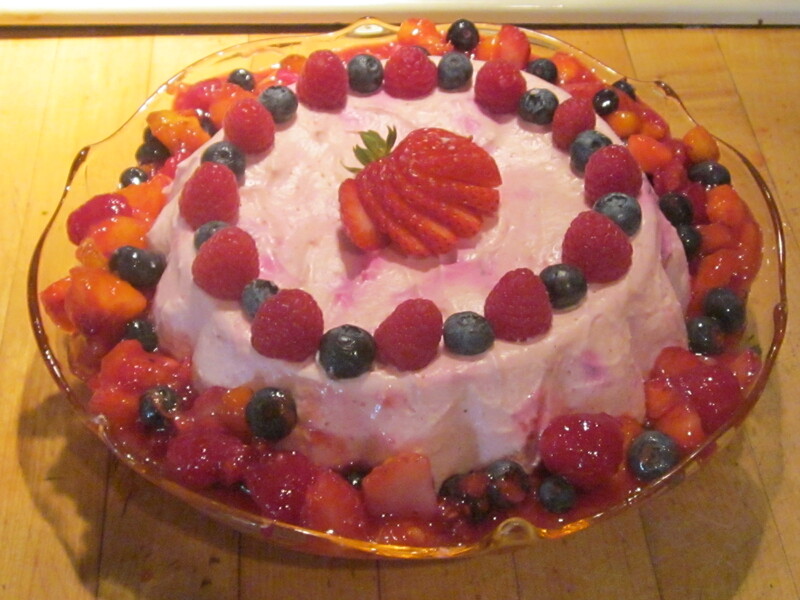 Unmold and decorate with fresh berries. Fill a large bowl with ice cubes and cold water. Have ready a smaller bowl that fits into the ice-water bath. Whip cream until it holds soft peaks. Refrigerate. Bring milk, almonds and sugar to a boil over medium heat, stirring occasionally to make certain the sugar dissolves.While milk heats, put gelatin and three tablespoons cold water in a microwave safe bowl or small pan When the gelatin is soft and spongy – around two minutes – heat it in the microwave for 15 seconds. If using a saucepan, cook it over low heat to dissolve. Stir the gelatin into the hot milk mixture and remove pan from heat. Pour the hot almond milk into the small reserved bowl and set the bowl into the ice-water bath. Stir in almond extract and vanilla extract and continue to stir until the mixlture is cool but still liquid. You don’t want the milk to gel in the bowl. Retrieve the whipped cream from the refrigerator and gently fold it into the almond milk with a spatula, then fold in the prickly pear pieces. Spoon the mixture into the 8-inch cake pan or the mold and refrigerate until set, about two hours.To make ahead, cover and refrigerate for up to a day. To easily unmold, put mold upside down over a plate. Dampen a kitchen towel with very hot water and put over the top of the mold until the blanc manger slides out. 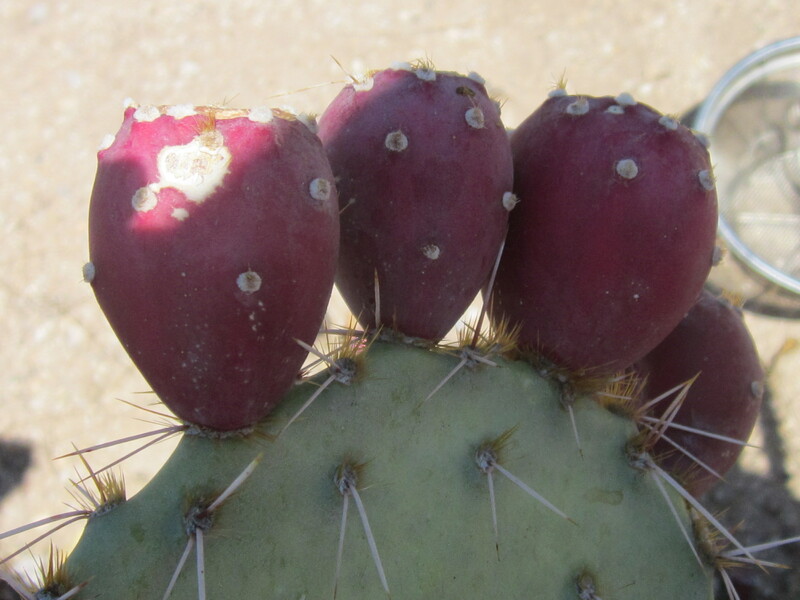 Want more recipes for prickly pear and other edible wild desert plants? You’ll find lots of great ideas in The Prickly Pear Cookbook and Cooking the Wild Southwest. Ask your local bookstore to order for you or follow the links to order on-line. This looks so fabulous that I want to harvest all day and make 10! Beautiful dessert, Carolyn! and I bet it tastes great!